As well as being an Alien Abduction Researcher, I have specifically analyzed data relating to alleged "abductees." 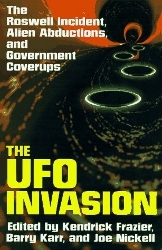 One of my analyses in this field is "a study of Fantasy Proneness in the Thirteen Cases of Alleged Encounters in John Mack's Abduction" which appears in The UFO Invasion (edited by Kendrick Frazier, Barry Karr, and me, 1997, pp. 237-244). It shows that the abductees are typically sane and normal but have a tendency to possess "fantasy prone personalities."